Great content begins and ends with great stories. Storytelling is one of the most powerful ways to engage and persuade an audience. But not if you’re telling the same old stories we’ve all heard a thousand times before. You need to tell truly original stories—otherwise, people will tune you out. Just in case you haven’t heard these tired old tales (*spoiler alert*) the jar isn’t full until it’s filled with gravel, sand and water, the other ship is actually a lighthouse, and the young man educates the older one on how saving just one life makes a difference. That last one’s been told so often, the star thrower character varies from an old man to a young man to a little girl to Jesus! These were all probably excellent stories when they were told, oh, 20 million times ago. But at this point, they’ve lost their impact due to overuse. How stale are these stories? When I Googled them I got 6 million, 4 million and 3 million hits, respectively. When I work with clients on a speech or other communication, they’ll often come to me with a story they want to use, which is great. I always encourage storytelling. But when they tell me they found it online, I suggest we look elsewhere. If it’s on the Internet, just assume everyone’s heard it before. So how do you come up with original stories? Here are five steps to discovering and collecting stories nobody’s ever heard before. Of course, the best way to ensure your story is original is to tell one from your own personal experience. I was working with the head of a sales organization who needed to challenge her sales force to focus on the nuts and bolts of selling. Many in her audience might view this message skeptically, coming from someone who was now ensconced safely in the executive suites. When I first started selling, I was petrified of making cold calls — going out and knocking on prospects’ doors. So whenever I went to a new office building I’d take the elevator all the way to the top floor, start there and work my way down. Because I knew if I was on the first floor, it would be far too easy to just walk out after the first couple of rejections. This story helped humanize her and it showed that she had actually walked in her audience’s shoes—she wasn’t asking them to do anything she hadn’t done herself. In addition to originality, one of the best things about telling a personal story is that because it comes from our own experience, it’s far more relatable than some abstract story found online. If you read mainly business books and trade journals, try casting a wider net. Look outside your industry. Pick up a magazine you’ve never read or check out a blog on a subject you’ve never explored. Inspiration can come from the most surprising places. Read non-business books, like biographies and memoirs — those are filled with stories few people have heard. 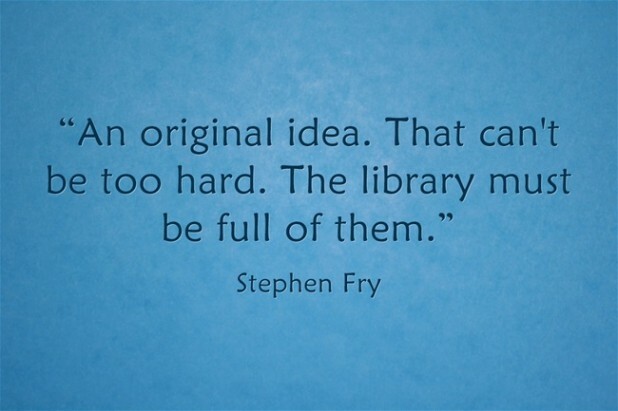 Or try a novel. Years ago, Ricky Gervais and Stephen Merchant had a crazy idea for a new workplace comedy. It would apply reality show conventions to the sitcom format, and the central character would be an insufferable jackass — the complete opposite of, say, Mary Tyler Moore or Bob Newhart. Nothing quite like it had been done on TV before, but they pitched the idea to the BBC, it got the greenlight, and “The Office” went on to become one of the most successful shows in television history. According to a BBC executive who was in on the pitch, it wasn’t so much what Gervais and Merchant said that day, but how they said it. They were so passionate, so enthusiastic — they believed so much in the idea that the executives couldn’t help believe in it, too. I use this story in workshops to illustrate the importance of putting passion and conviction behind your words. It may not quite rival the starfish story for drama or the lighthouse story for surprise, but it works. Practically everyone has seen the “The Office,” so people relate to it easily. I found it because I happened to be reading a New York Times Magazine feature about Gervais. Buried within that 3,500-word article were two paragraphs that got my attention and became the basis of the story. I find story ideas everywhere I go — at the gym, the grocery store, on the bus or on vacation. Last year I visited the Grand Canyon, which is one of those amazing places that can be as dangerous as it is beautiful. So the park service goes to great lengths to warn visitors about all the hazards: consult a map, bring enough food and water, wear a hat and sunscreen, understand the effects of altitude, etc. But most of us have grown immune to these kinds of warnings. When was the last time you listened to a flight attendant’s safety instructions? It tells the story of a young woman named Margaret Bradley. 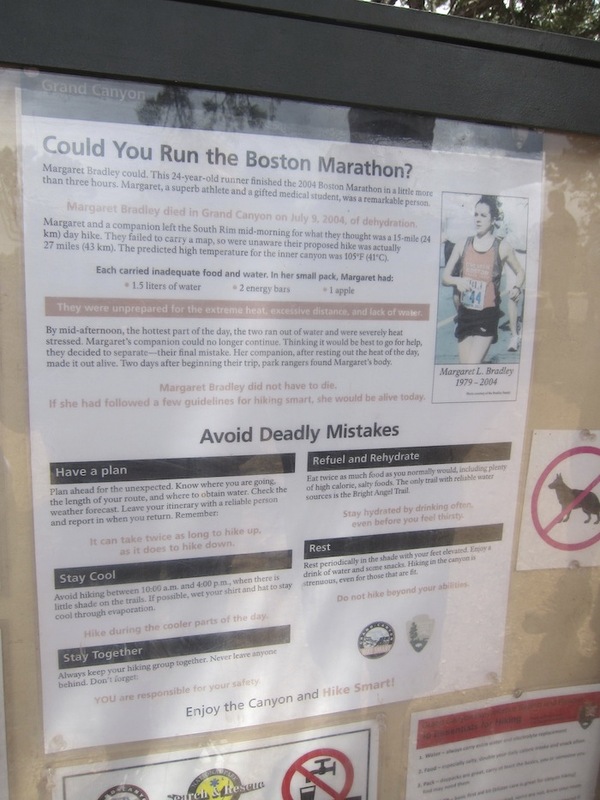 She was 24 years old and in top physical condition, having run the Boston Marathon in a little over three hours. She came to the Grand Canyon, went for a hike, got into trouble, and ended up dying near the bottom of the canyon. The message: if it could happen to her, it could happen to any of us. And the photo of Bradley helps us relate — this could be our sister, our daughter, our best friend. It’s a powerful story that likely makes people think twice about whether they’re adequately prepared for the Grand Canyon’s dangers. I know it had an impact on me. And it’s become a story I often tell about how to break through the clutter and bring attention to an important, potentially life-saving, message. Once you program yourself to be more attuned to stories, you’ll find they’re all around you. In fact, you could easily get overwhelmed. That’s why it’s important to have a filter. That means knowing what you stand for — your brand, strategy or point of view. For instance, my mission is to help people communicate more successfully, whether they’re presenting to prospects, talking to employees, or just interacting in their everyday life. So I’m always on the lookout for stories about communication skills — engaging an audience, tapping into emotion and, of course, storytelling itself. What’s your purpose or mission? To help people express their ideas visually? Invest wisely? Make the most of their limited time? Whatever it is, let that serve as your filter. I tell hundreds of stories in my books, workshops and other communications. And yet I’m rarely ever in the position of having to Google a term like, “inspiring stories about leadership” or some other subject. That’s because I collect them, catalog them and store them for later use. You can do this with an app like Evernote or with a sophisticated Content Management System or a plain old physical file folder. Whatever works for you. The goal is to never find yourself in the position of having to dust off some tired old anecdote about Winston Churchill or Steve Jobs that will make your audience roll their eyes and tune you out. • Story, by Robert McKee, is a sort of bible for screenwriters, but millions of people outside the industry have relied on its lessons to create and tell better stories. • Malcolm Gladwell won’t tell you how to craft a story, but he will show you, which is an important way to learn, of course. Pick up any of his books and observe how he turns complex subjects into riveting, human-scaled stories. • Storytelling and presentation expert Nancy Duarte has a knockout TED Talk on the subject that will give you far more than your 18 minutes’ worth of time invested. • I have also written a thing or two on the subject that you might find useful. It’s true that few things beat a well-told story. At the same time, few things are worse than a story that’s worn out its welcome. It pays to be original. Rob Biesenbach is a corporate communications professional, a Second City-trained actor, a professional public speaker and the author of two books: Act Like You Mean Business and 11 Deadly Presentation Sins. Follow him on Twitter: @RobBiesenbach. Visual.ly is a NewsCred partner!